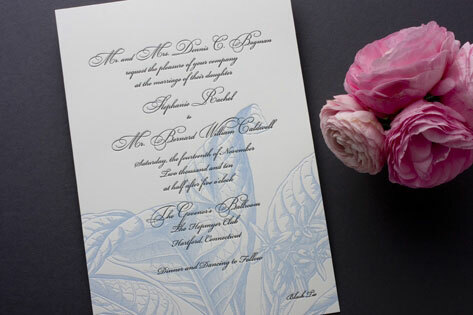 A lovely letterpressed leaf illustration serves as the backdrop for this elegant wedding invitation, while a script font takes the elegance of this suite to the next level. A wonderful choice for a ceremony at any time of the year. Available in blue ice/charcoal (shown), taupe/chocolate, and white snow/plum.